What are the dimensions of a Facebook cover photo? How do I account for the profile photo space? Our team gets asked those questions on a regular basis. It can be frustrating trying to design and perfectly align your Facebook cover photo so that it does not interfere with your profile photo. We created a quick visual guide to help! Check out our "Anatomy of a Facebook cover photo" graphic. Have you ever heard of mobile philanthropy? We at Social Exchange Solutions certainly hadn't until the folks at Mobile Matters reached out to us for help! Mobile Matters is a non-profit organization that aims to help other non-profits use technology to further their mission. Earlier this year, we built a Drupal webform to better facilitate Mobile Matters' grant application process for those affected by Hurricane Sandy. We are proud of our diverse portfolio and we encourage more non-profit organizations to reach out to us! Contact us to learn about our non-profit discount or Drupal services. 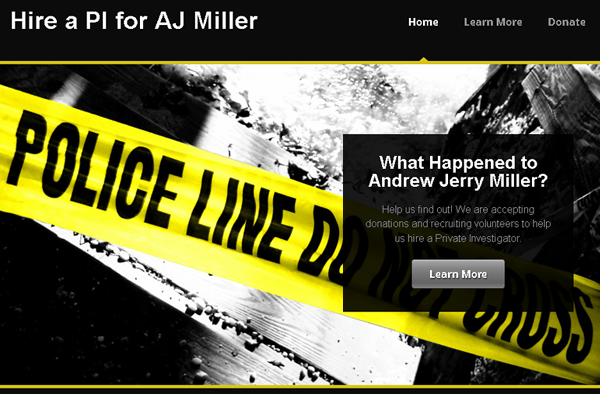 This week we had the pleasure of developing a new website for the AJ Miller Foundation. The "Hire a PI for AJ Miller" project launched earlier today. We were glad to provide AJ's mother a resource to further the investigation into her son's death. This is a cause worth buzzing about and we were glad to help! Upon first glance it may seem like IFTTT is trying to reinvent the wheel. Most social media platforms include the ability to automatically distribute your posts, photos, news and more across various platforms. There are also a handful of popular services wielding their ability to disperse content with ease and even some advanced customizations. Dig a little bit deeper and you will realize IFTTT is not reinventing content distribution; it is revolutionizing it. IFTTT leverages user-created triggers and actions known as recipes. Learn more and join by visiting IFTTT's website. Contact us for further assistance and other social media coaching services in Houston, Texas. Have you tried Twitter Ads yet? If you haven't, it is definitely worth checking out. The account setup and campaign options are intuitive. The dashboard itself is slick and clean. It's a great advertising platform for beginners. If you are already a Twitter Ads user you might not have noticed yet but you now have the option to switch to an "advanced" dashboard. This dashboard was previously reserved for big name Twitter Ad customers. We at Social Exchange Solutions switched today and we are happy to report how impressed we are with the enhanced analytics! Social Exchange Solutions offers online advertising services including creating and managing Twitter, Google and Facebook ad campaigns for your business. 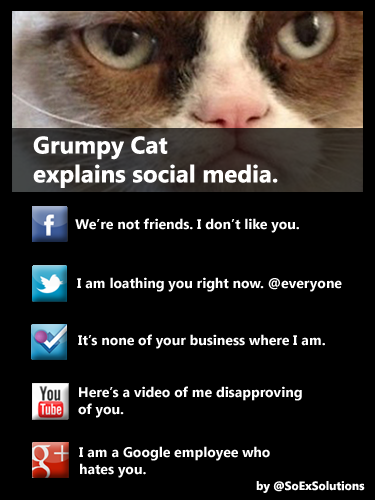 Grumpy Cat explains social media- with a little help from the buzz artists at Social Exchange Solutions. One of our favorite customers is the Sweet Lola Yogurt Bar. Not just because of their dazzling product- after all, who doesn't love yogurt- but also because of their dedication to customer service and products they believe in. They exemplify what it means to be a successful customer oriented small business. The Social Exchange Solutions web development team focused on channeling visitors to the Sweet Lola Yogurt Bar Facebook Page since the owner heavily relies on social media to connect with customers. Notice the large "Like us on Facebook" button on the website landing page. Not only is this an example of social media linking, but it's not a standard "Like" button. Our designers created a custom, theme appropriate, "Like" button for the Sweet Lola Yogurt Bar website. We can do the same for your company's website! Contact us to find out more and if you find yourself near Midtown in Houston, Texas be sure to stop by this lovely boutique yogurt bar. Newsletter marketing has proven to be a powerful and cost effective small business tool for many years. What are the benefits? Cost - Usually the cost involved is simply the time your marketing team spends on the one-time account setup along with the ongoing tasks of building your subscriber list, organizing the content, designing the layout, and delivering the newsletters. It is important to note digital newsletter campaigns are far more green than traditional paper-based newsletter or flyer marketing. MailChimp is our provider of choice. Social Media Linking - Trying to get people subscribed to your newsletter? Share the signup link on your company's Facebook page, Twitter Feed, or website. Trying to get people visiting your social media accounts? Share the account links in your newsletter. SEO - Typically newsletters are distributed via email which has no inherit search engine optimization benefits *unless* you take advantage of our tip to archive your newsletters on your website. We recommend that you provide incentives for newsletter subscriber signup on a fairly regular basis. For example, run a blurb offering a discount on services for new subscribers within the next 24 hours. Also be upfront about the frequency of your newsletter distribution and the fact that your customers can unsubscribe at anytime. If you are interested in Social Exchange Solutions providing newsletter service to your small business, please contact us. Reveille Loves Us is a family owned and operated pet service agency serving animals and their owners in Bryan, College Station, Texas. Social Exchange Solutions implemented a mobile-first, responsive, design based on Twitter Bootstrap for the Reveille Loves Us website. This website was built with literally every browser and device in mind! The way your clients access the web- including your business website- is changing. SES is ready and willing to adapt so that your clients stay engaged! Learn more about the importance of responsive web design from Smashing Magazine.